Gronwen Wharf was built to receive coals from the mines at Morda and Coed y Go. 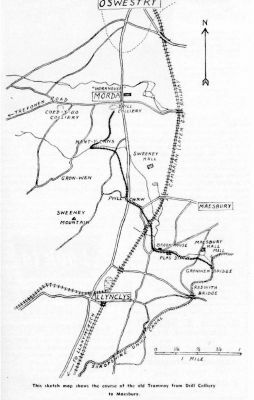 Sketch showing the route of the tram,way from the Drill colliery down to the Montgomery Canal at Gronwen Wharf. A small number of very early rails have been recovered from the canal at Gronwen wharf together with three wheels from a truck. The rails were about 3 feet long and sat on stone blocks about 3 feet apart. 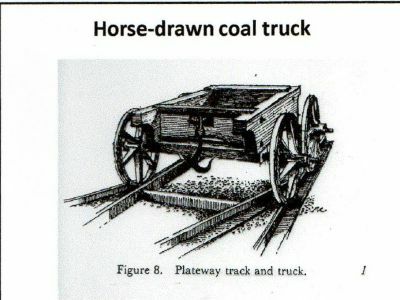 Because of the weight of the trucks laden probably amounted to about 4 tons, there were frequent breakages which resulted in the tramway having to be relaid with upgraded track. This photo is of two of the wheels recovered from the canal. 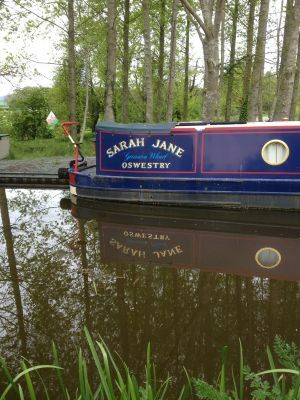 Photo of a canal boat moored on the Montgomery Canal displaying the Gronwen Wharf Oswestry sign. There are very few boats on the canal network with this sign on.